R. Scott Baltz first came to Maine in the 1980s as a photographer looking for new landscapes. 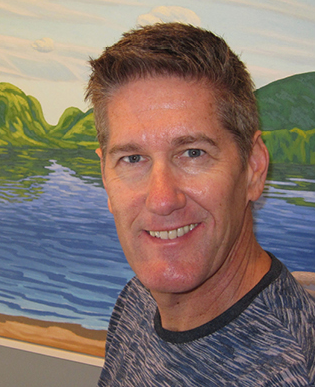 He found inspiration on Mount Desert Island, where the mountains rise out of the sea. Since 1997, he has lived on that monumental island year-round, painting it in an expressionistic manner that owes as much to memory and imagination as it does to observation. Mount Desert Island has been painted since the 19th century. How do you find fresh inspiration? I find that I love this particular place just as much as when I discovered it in the late 1980s. I spend a great deal of time outdoors, whether hiking, swimming, biking, or fly fishing, which allows me to take the time to see or at least to be open to seeing. I very much enjoy the changing light here and especially the cloud formations. Clouds give sky character and often a painting or idea begins as a result of something in the sky that has sparked my interest. As well, I find I can shake things up by exploring a different approach in applying paint or using a different palette. Many landscape painters work from direct observation. How did you come to work from memory? Working from memory seems to have come naturally to me. For many years, I worked with the 4×5 large-format camera, which forced me to slow down and take my time to see and focus on the details within the landscape. 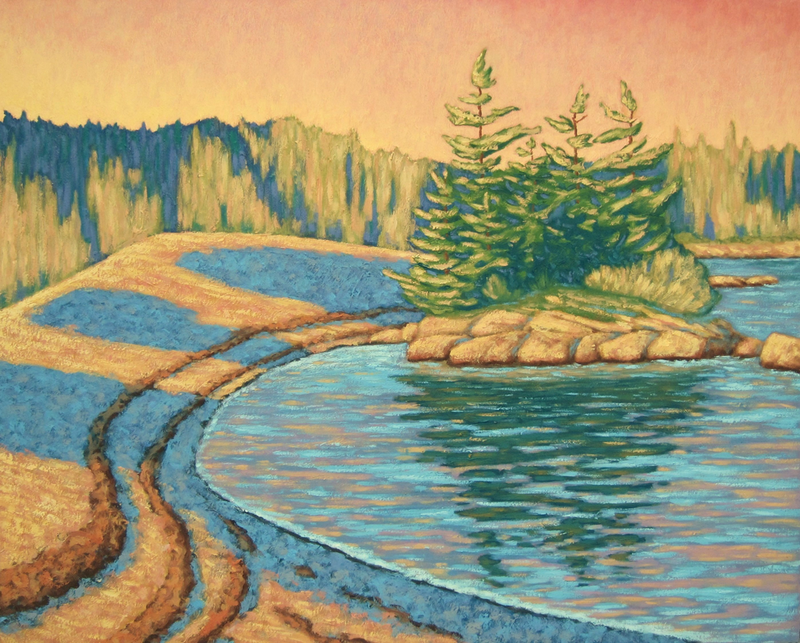 When I transitioned into painting, I was no longer interested in the details, but more the essence of a visual and sometimes spiritual experience where I hone in on one particular something that stands out within the landscape. Gold Blue Broken was inspired by a walk on the Schoodic Peninsula. What impressed you, and why did you choose this painting for The Art of Giving? I recall it as a pleasing natural composition. In the execution of the image, I accentuated the curved foreground shape, removed the detail of the far tree line, and played with the color of the blue shadows along the heap. Overall, the piece became an exploration in the juxtaposition of warm and cool. I chose this particular painting because it speaks of Maine. Why did you choose to support Harbor House Community Service Center? I’ve supported Harbor House for many years, both as a user and through fundraising events. As I became part of the community, I worked out in the gym on a daily basis and was welcomed by friendly faces. 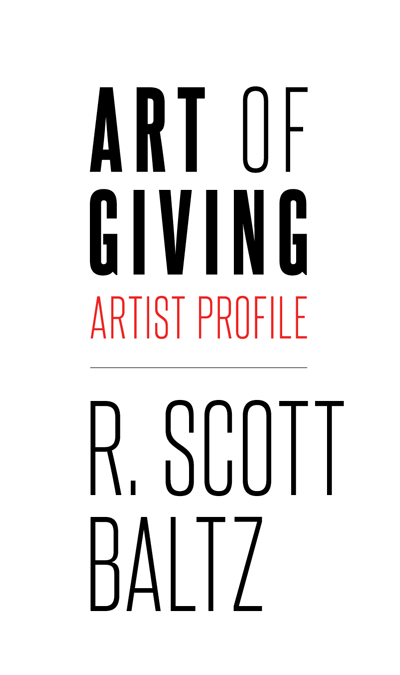 See more of R. Scott Baltz’s work! The Art of Giving is Down East’s annual celebration of Maine art, artists, and the community organizations they hold dear. This year’s event is generously sponsored by Northbridge Companies, the Maine Community Foundation, Globe Pequot/Down East Books, Cellardoor Winery, and Camden National Bank.